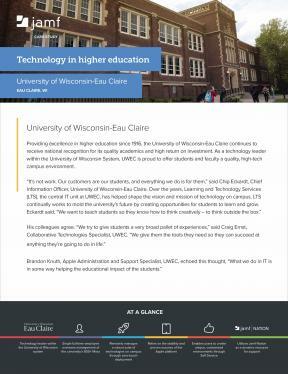 The University of Wisconsin-Eau Claire continues to set the technology standards within the UW System. They are proud to offer students and faculty a quality, high-tech campus environment. UWEC now has more than 650 Macs on campus, a number that continues to see steady growth. Prior to implementing Jamf’s software, all computer issues that arose required an in-person fix from an IT staff member. This meant countless hours of schedule coordination and long treks to all corners of campus to access faculty computers. This all changed with Jamf.